Best viewed on your mobile device. 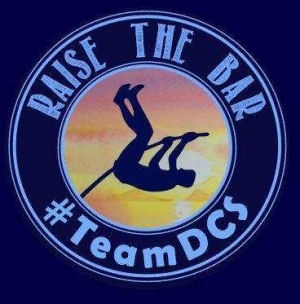 Not a DCS Employee? Click HERE to Subscribe. 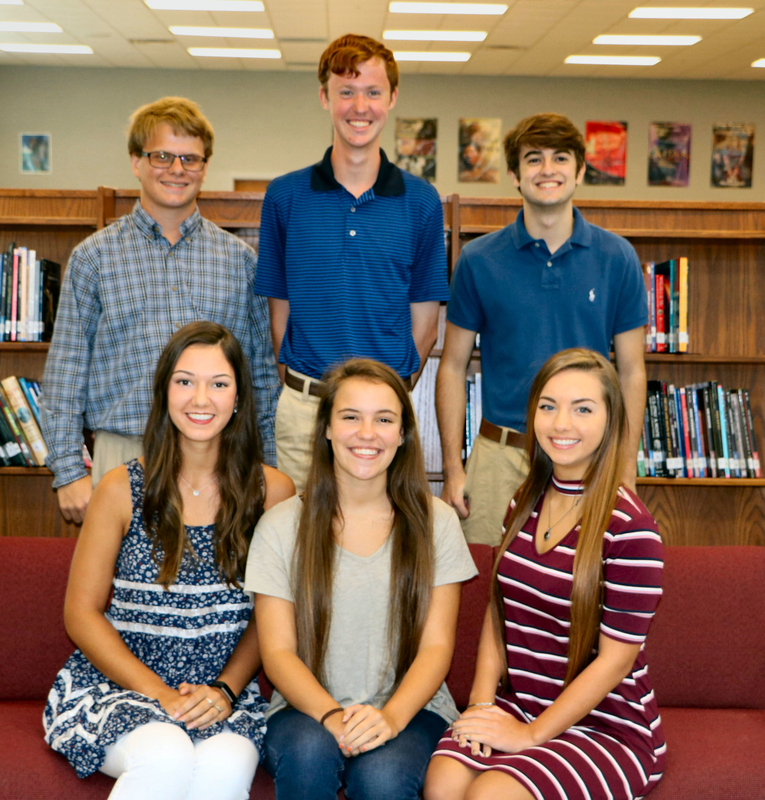 School district officials were notified by the National Merit Scholarship Corporation (NMSC) that 19 students were selected as Semifinalists, and one student was selected as a Commended Scholar in the 63rd annual National Merit Scholarship Program. 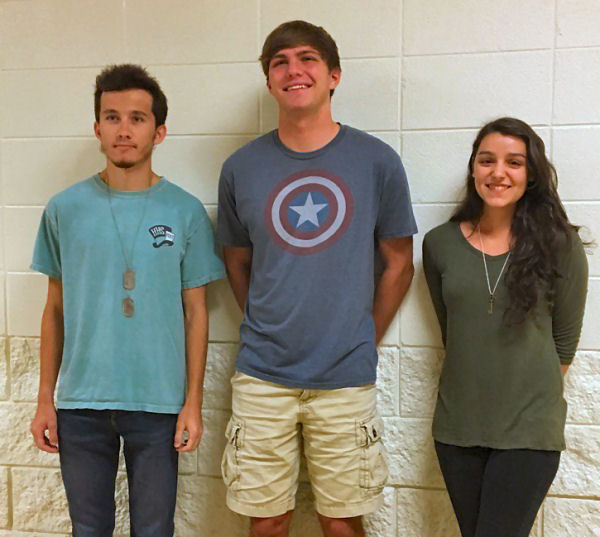 According to the National Merit Scholarship website, “these academically talented high school seniors have an opportunity to continue in the competition for 7,500 National Merit Scholarships worth more than $32 million that will be offered next spring. To be considered for a Merit Scholarship® award, Semifinalists must fulfill several requirements to advance to the Finalist level of the competition. 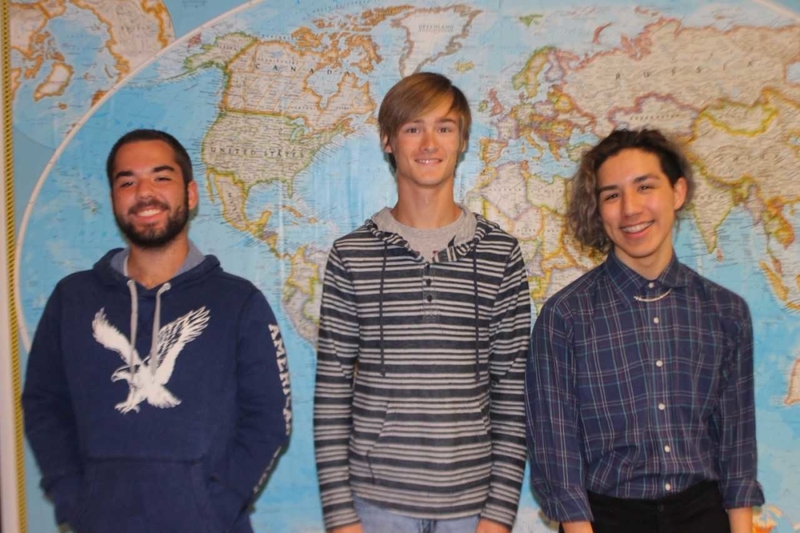 About 90 percent of the Semifinalists are expected to attain Finalist standing, and about half of the Finalists will win a National Merit Scholarship, earning the Merit Scholar® title. 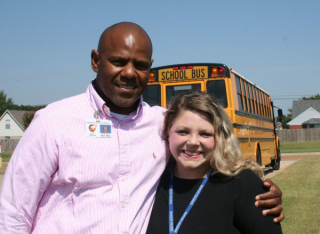 DeSoto County School District has 400 bus drivers. One driver is also a senior nursing student. 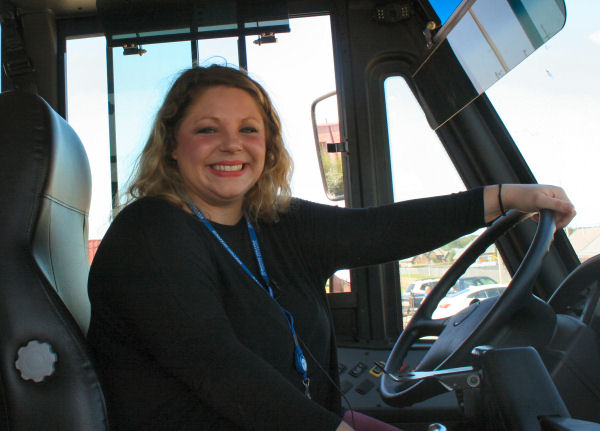 Codi Parks was driving her morning route when a mother of three bus riders ran out and said her husband was in distress. Parks asked her if she had called 911 and if she knew CPR. She said she had called for help, but did not know CPR. Parks followed standard procedures to secure the bus and immediately went into action. She took the keys, put on the emergency brake, got the students’ grandmother to watch her students and went into the home to find the husband unresponsive. Her quick actions helped him to resume breathing. First responders were quickly on the scene and helped take over. Parks resumed her route and got her students to school on time. Jeanette Valdez began her soccer career when she was three years old. Kicking with accuracy is a skill she has refined for the last 14 years. Valdez’s initial reaction was laughter, but the more she thought about it, the better she liked the idea. She made an appointment with HLHS Head Football Coach Brad Boyette and asked him if he thought she could contribute to the team. He knew her reputation as captain of the HLHS soccer team, and was very receptive to the idea, informing her of the requirements to comply with MHSAA and to earn a position through try-outs and practices. 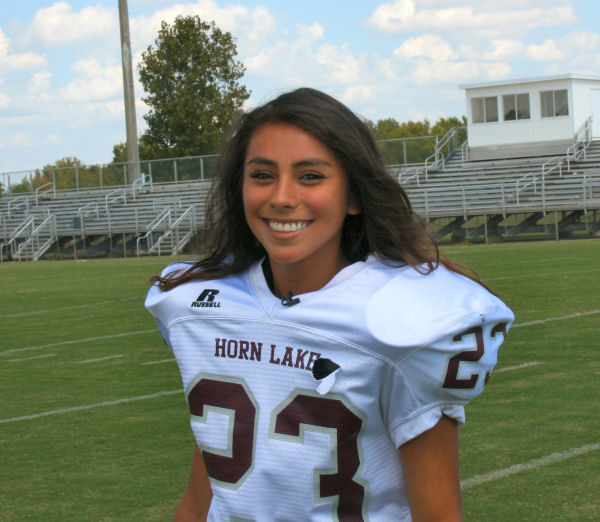 “Jeanette is a serious athlete,” Coach Boyette said. “She is fearless. Any student—male or female—who has this level of commitment, is the type of player I want on my team." Coach Boyette was not worried about the fact that she would be the first girl to play varsity football for any high school in DeSoto County. He also was not worried about the reaction of his other players because Valdez is known for embracing challenges to be the best she can be at whatever project she’s trying, athletics or academics. 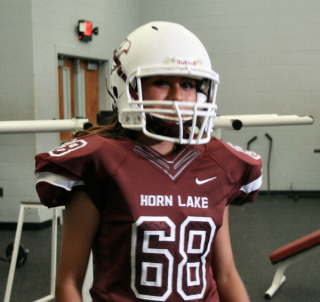 With a 4.2 GPA, this petite, 115-pound young lady looks like she should be on the homecoming court. What do her fellow players say about the newest addition to their team? Nakobe Dean is a junior outside linebacker and has been named as the #1 recruit in Mississippi for 2019. He already has offers to play football at Alabama, Michigan, Mississippi State and other schools, but has not made a decision. The Mississippi Association of Secondary School Principals (MASSP) selected Lewisburg High School’s Chris Fleming as the 2017 Mississippi High School Principal of the Year. 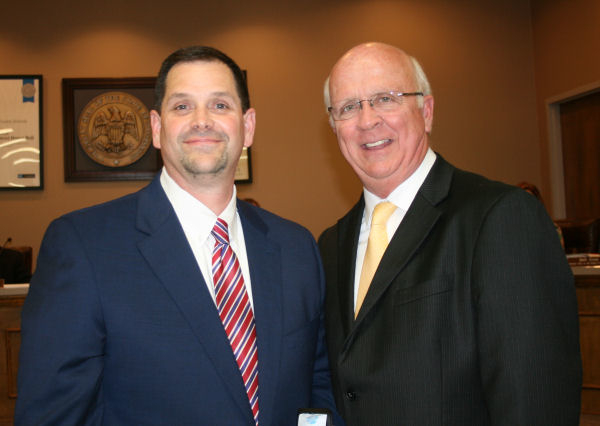 Fleming was recognized by the DCS Board of Education and made the journey to Washington, DC as Mississippi’s nominee for the National High School Principal of the Year. This was the second time Fleming was recognized by this organization with a top honor. In 2013, he was named the MASSP Middle School Principal of the Year. At that time, he was Principal of Lewisburg Middle School. Top principals are awarded the recognition based on their impact in the areas of collaborative leadership, curriculum, instruction and assessment, and personalization of the learning environment. Greenbrook students enjoy Minds in Motion at the beginning of each school day. It takes about 20 minutes for 500 students at Greenbrook Elementary School to go through 15 stations of “Minds in Motion,” a national program aimed at strengthening the brain’s ability to process and organize information correctly. Students walk upstairs -- backwards. They do a “jellybean roll” across a padded mat. 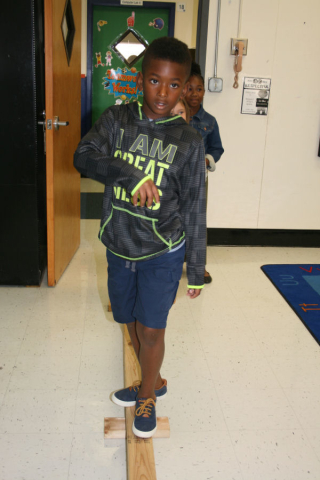 A low balance beam requires students to focus. Students track a popsicle stick with their eyes as a teacher slowly moves it in front of them. 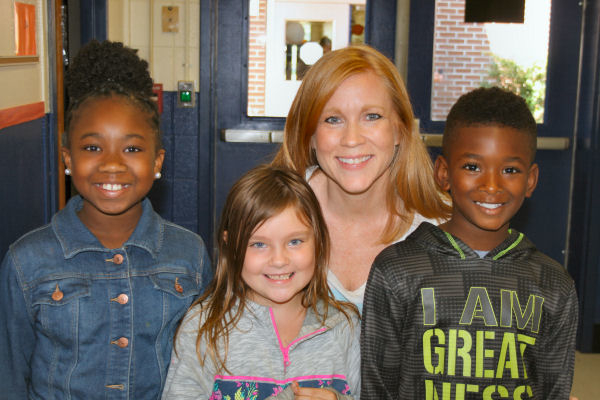 “We do these quick movements at the beginning of the day,” said GES Principal MeLynda Crockett. “The students love it. I have had parents tell me their child does not want to be late to school because they do not want to miss Minds in Motion." Dr. Stephanie Stewart, director of academic services, introduced this program and provided trainers from Minds in Motion to implement the program in DeSoto County Schools. With Meyer's struggling students, extra reading and tutoring only marginally helped and did not get to the core of the problem. 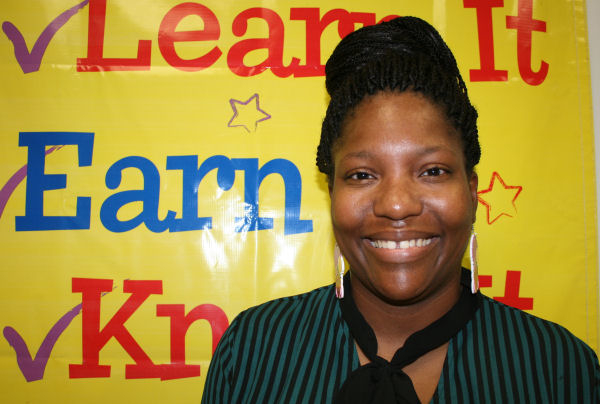 This motivated her to develop a program that would make a difference for all students. 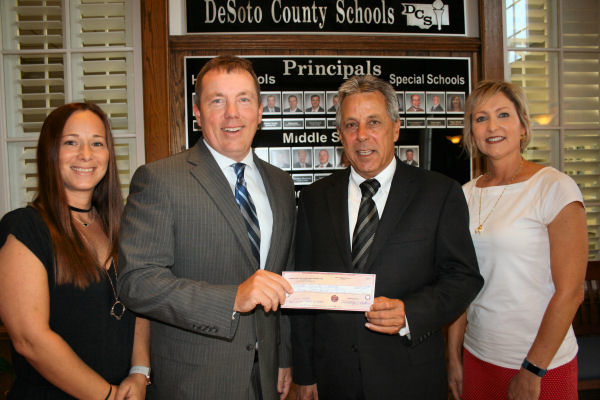 Hernando Mayor Tom Ferguson presented a grant check for Hernando Elementary Schools to Superintendent Cory Uselton. Left to Right: Jessica Green, Superintendent Cory Uselton, Mayor Tom Ferguson and Gia Matheny. 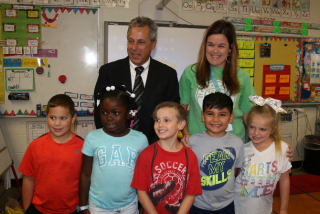 The elementary schools in Hernando are getting a technology boost, thanks to Hernando Mayor Tom Ferguson and the Homer Skelton Charitable Foundation. Superintendent Cory Uselton met Ferguson at Hernando Elementary School to tour the school and meet some of the teachers and students who will benefit from the $43,000 grant. The grant will be divided among three schools—Hernando Elementary, Hernando Hills Elementary and Oak Grove Central Elementary. Hernando Elementary will receive 24 desktop personal computers for teachers. Hernando Hills Elementary and Oak Grove Central Elementary will each be awarded six interactive projectors for classrooms. The Homer Skelton Charitable Foundation contacted DCS and asked what were the greatest needs in Hernando. Technology Director Lendon Balch and Computer Technician Shelby Elmore walked through the elementary schools and found that personal computers were needed at HES and interactive projectors were needed at HHES and OGCES. “The most enjoyable part of this job is to represent the public and to consider the well-being and interests of the City of Hernando,” Ferguson said. 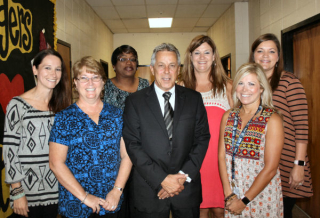 After touring three schools, Ferguson visited DCS Central Services to present the check to Superintendent Uselton. Uselton said, "We constantly work to keep our technology up to date in all of our schools. We are excited and appreciative of this unexpected boost to our technology program in elementary schools in Hernando. We thank the mayor and the Homer Skelton Charitable Foundation for their investment in our schools. Our teachers are thrilled. We have many wonderful community partners." 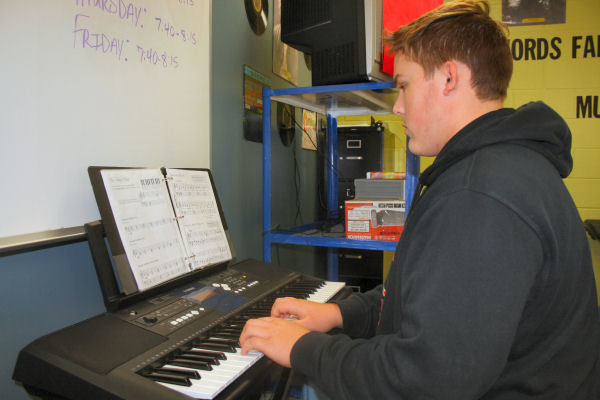 Jared Davidson plays football, baseball and the piano. 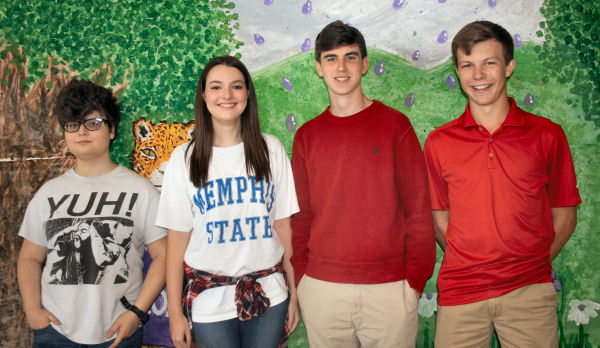 Students interested in learning to play the piano may do so through a nine-week program offered at Southaven High School. Little by little, Southaven High School was able to purchase enough keyboards and headsets to outfit a modular piano lab that serves 11 students at a time. The teacher is Logan Brasher. He has a weighted keyed, electronic piano he uses for instruction. Brasher also teaches general music and is the pianist for the award-winning choral department. He provides highly individualized instruction. Students come to class, put on their headphones, and begin practicing on their own. Brasher makes rounds, tracking students’ progress by watching their hands and discreetly providing extra help to struggling students while challenging those who excel with new applications of the concept. Jared Davidson, a sophomore, is taking the class. A football and baseball player, Davidson learned how to read music from his middle school years in band. “Jared is good at this. He was in the percussion section which developed his timing. 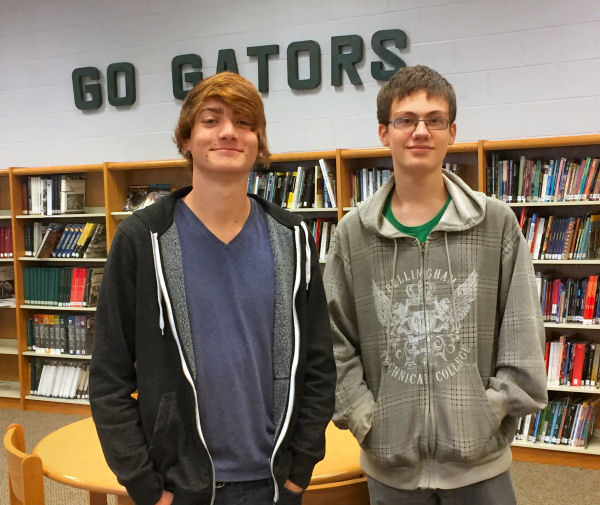 I hope he will take other lessons when he completes this class because he has talent and is a natural,” Brasher said. Brasher says some students never have to be asked to practice. In fact, they don’t want to stop. Piano is also taught as a class at Horn Lake Middle School. The teacher is Rebecca Brasher, wife of Logan Brasher. When you are learning a new skill or beginning a new task, it is always good to have a starting point. 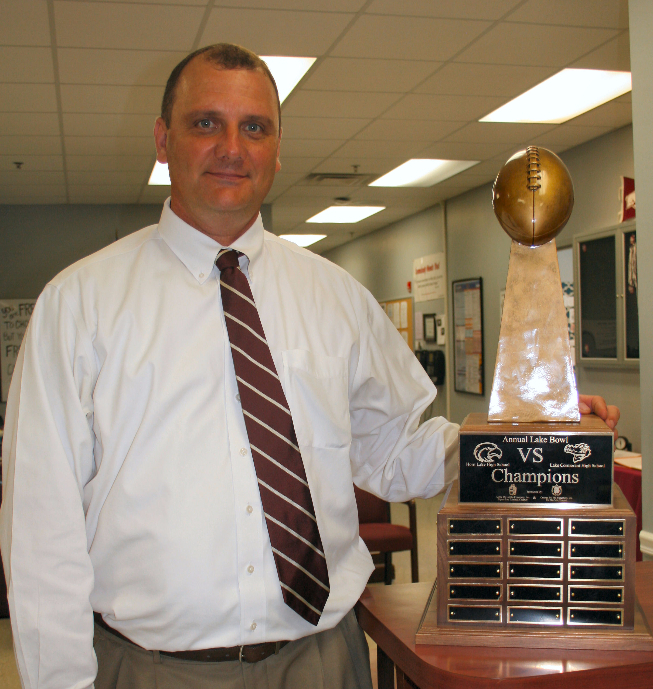 In Mr. and Mrs. Brasher’s piano classes, the starting point is Middle C.
HLHS Principal Andy Orr shows off the "Lake Bowl" traveling trophy. Healthy rivalries are a good thing in high school athletics. This is how and why the traveling “Lake Bowl” Trophy was created. Representatives of Alpha Phi Alpha and Omega Psi Phi Fraternities met with Horn Lake High Principal Andy Orr and Lake Cormorant High School Principal Rhonda Guice and suggested the fraternities provide a substantial trophy that could be used year after year to recognize the winner of the HLHS vs LCHS football game. 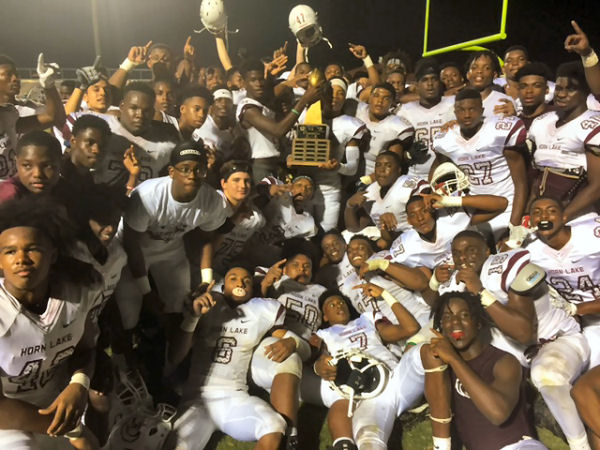 Horn Lake High was victorious over Lake Cormorant High, so the new trophy now is displayed in the front office of the school. A number of patriotic individuals and groups like to see new, fresh American flags flying at DeSoto County School District’s 42 schools. Chief Mussacunna Chapter of the Daughters of the American Revolution is no exception to this rule. 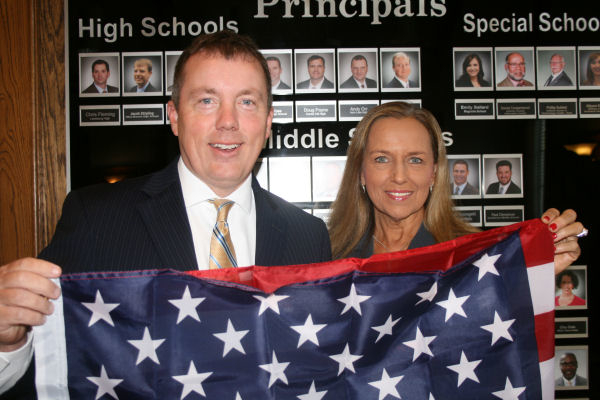 DAR Member Ginger Britt presented 17 3’ x 5’ flags to DCS Superintendent Cory Uselton. There is an ongoing program designed to provide new American flags at all schools each year. The donation also coincided with Constitution Week. “Constitution Week is a great time to learn more about this important document and celebrate the freedoms it gave us,” said Britt, the Constitution Chairman for her DAR Chapter. Faithful groups that support this program every year are DeSoto County Republican Women, The Anderson-Jordan Detachment of the Marine Corps League, the American Legion Post 10, the American Legion Post 1990 and the Felix LaBauve Chapter of the DAR. Individuals have often donated funds for the flag program to honor a loved one, friend, or family member or as a memorial. Contact the Communications Department at 662-449-7122 if an organization or individual would like to participate in the program. The idea was conceived by DeSoto Economic Council’s Leadership DeSoto, but the actual outdoor education classroom, Tiger Pavilion at Hernando High School was a community effort. Duane Case, principal of HHS, said the pavilion will have multiple uses. He welcomed guests to the ribbon cutting from Community Bank, the Hernando Mayor’s Office, Community Foundation of Northwest Mississippi, Hernando Optimist Club, Cerberus Construction, Walmart, the Krewe of Hernando and Fairway Mortgage. Located across from the football stadium, the pavilion will eventually have benches that convert to desks or tables. 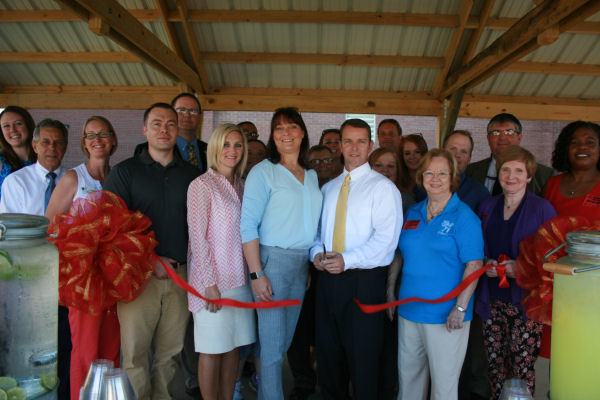 Jennifer Ward, a vice president with Community Bank in Hernando, was a member of the Leadership DeSoto class that came up with the idea of the Tiger Pavilion. “As ambassadors of the Hernando Chamber, our Leadership DeSoto class attended another ribbon cutting at HHS for the ‘Grub Hub,’ a large greenhouse. At this event, we heard teachers say they would like an outdoor classroom. A community project is part of our leadership training. We took the concept back and everyone loved it,” Ward explained. A metal plaque will hang on the pavilion recognizing the contributors. 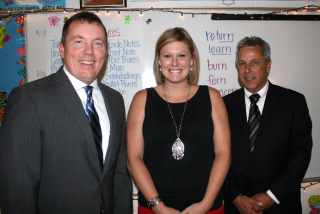 Walls Elementary Teacher Chevonne Dixon was selected to serve on the Mississippi Superintendent’s Teacher Council. More than 150 teachers applied for this honor, but only 60 were chosen to provide feedback to Dr. Carey Wright, state superintendent of education, on the initiatives of the Mississippi Department of Education (MDE), the Mississippi State Board of Education (SBE) and the Mississippi State Legislature. The Mississippi Superintendent's Teacher Council aims to empower teachers to discuss topics critical to their success in the classroom and how MDE can assist. “We want to learn from our teachers in the classroom who often implement effective strategies that can be shared and replicated statewide. They provide valuable insights that could improve MDE initiatives. Additionally, the MTC will provide a venue for teachers to become advocates for their students and their profession through input into the decision making process,” said Dr. Wright.